PHUKET: Police arrested two Burmese workers with about 200 kilograms of krathom in Patong yesterday. Col Chaiwat Auikam of Patong Police handled the case. “We same a man, who we later learned was called ‘Piew’, acting suspicious in front of SuperCheap Patong. He tried to escape when we approached him. He was clean, but upon inspecting his motorbike we found a 5kg krathom packet underneath the seat and another 80kgs in his room nearby,” the colonel told Phuket Gazette reporters. Mr Piew then revealed to the police that his neighbor, named Anek, also had drugs in the room next to his. Police found 100kg of krathom there. “Mr Piew and Mr Anek confessed that they were planning to sell to other foreign workers and young locals. 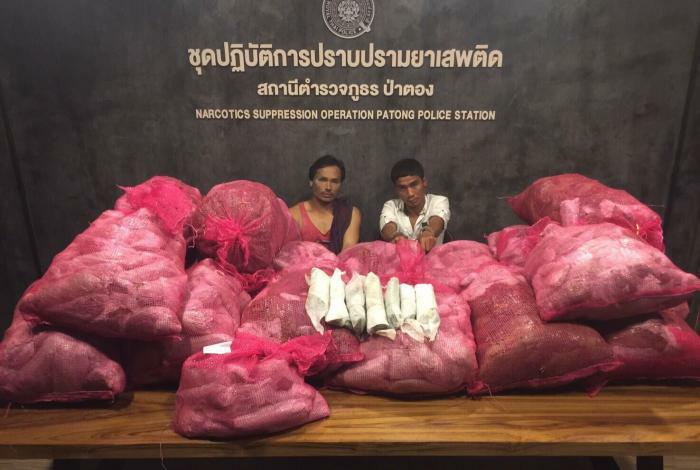 They were charged with possession of category 5 drugs with intent to sell,” said Col Chaiwat.